According to our members the best Round-Robin in 2017 was the Tata Steel Chees Tournament in Wijk aan Zee, winning by a single vote over the Sinquefield Cup in Saint Louis! Third, with some distance, came the London Classic and farther away was the Norway Chess in Stavanger. The category Official Events saw a distribution of votes without a clear favourite. The European Team Championship in Crete closely edged (by 2 votes!) the European-ACP Women Rapid and Blitz, which in turn was only 2 votes ahead of the Tbilisi World Cup. It seems the category Open Events is the most established one as once again, like last year, we see the best opens in the world easily ahead of all the others. The Tradewise Gibraltar won by 3 votes ahead of Chess.com Isle of Man International while third was the Reykjavik Open. These three opens have solidly established themselves as the favourite among the chess community worldwide! The category Rapid and Blitz saw the effect of the return of Garry Kasparov. The Saint Louis Rapid and Blitz won the contest by 2 votes ahead of the Grand Chess Tour in Paris. Third was the Saint Louis Champions Showdown and these results suggest that the organisers from Saint Louis and the Grand Chess Tour are doing a great job in organising and promoting these events! We would like to congratulate the winners and thank them for the excellent job they are doing for enhancing the prestige and improving the image of our beloved game. We would also like to thank all the participants for taking time to cast their votes, even at a time when season holidays generally rule our lives. 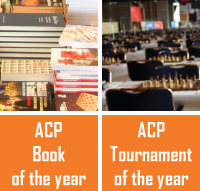 ACP strives to improve the world of chess by considering the opinions of our members and we can only know them when you tell them to us. This is very important and we will continue to work in this direction in the future.